One video poker’s Tuesday morning got off to an excellent start this week when they won the jackpot playing Progressive Jacks or Better from Gamesys and collected £46,061. 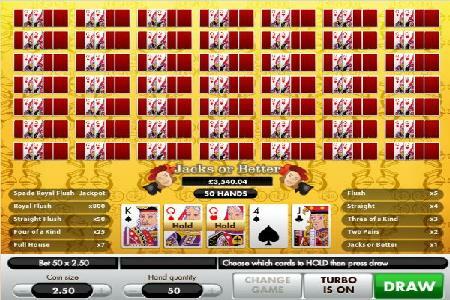 An online video poker player has hit the jackpot playing Progressive Jacks or Better and won an impressive £46,061. Jacks or Better is a well-known video poker game, but this version has a few features that make it unique. First of all, the graphics have obviously been designed with real care and it looks significantly better than many of its counterparts. Secondly, a royal flush is not enough to hit the jackpot, players need a royal flush of spades to win the progressive jackpot while a royal flush of hearts, diamonds or clubs will win 800x the bet. The jackpot is hit via Progressive Jacks or Better roughly every 7 weeks. On average it pays out £13,300 but as it seeds at £2,000 the pay-out can be much lower than this. The win this week was by far the largest jackpot the game has ever paid out, it was over £20,000 bigger than the previous record. Progressive Jacks or Better can be played in both single and multi-hand modes. 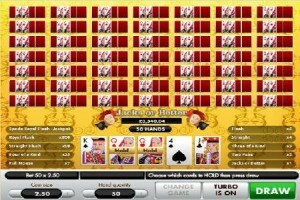 Players can choose to play up to 50 hands at once. The idea of the game is to build the best poker hand possible and unsurprisingly it pays out for hands that contain a pair of jacks or better.